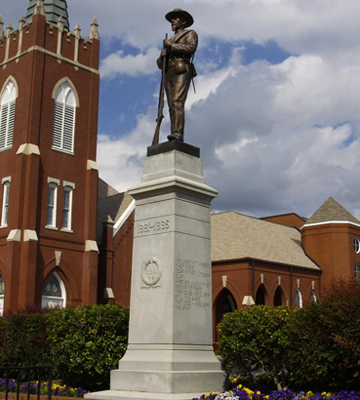 A statue of a common Confederate soldier stands atop a pedestal. The monument stands around ten feet tall and about four feet wide. The inscriptions are on three sides of the monument. The inscription on the right side quotes from Rudyard Kipling’s poem “Recessional,” which was composed on the occasion of Queen Victoria’s Diamond Jubilee in 1897. The monument was located on the lawn of Central Elementary School in the downtown area but now stands in a small public park area. Mr. R. L. Brown spoke at the unveiling. Dr. (Major) T.A. Hathcock was the master of ceremonies and Miss Mary Mabry made the presentation address. Mrs. M. H. Morton accepted the monument on behalf of the UDC chapter. Veteran William Snotherly gave “reminiscences” of the war days and “Aunt Betty” Austin, oldest member of the UDC chapter, was chosen to unveil the monument. The monument is located on South Depot Street, Albemarle, NC 28001. It is the memorial's fourth location. The monument is situated behind three flags in a small public park, right off a public street. The monument was originally located on a median in the center of the 100 Block of North First Street. In the early 1950s, it was relocated to a prominent location in front of Central Elementary School. The statue remained at this location until 1970 when it was moved to North Second Street in front of a Methodist church. Approved by city commissioners in 1924.